Preheat the oven to 220°. The Sole Mio lasagna is ready for the oven, without boiling. In a medium bowl, whisk together the ricotta cheese, the egg, a pinch of salt, some freshly ground pepper and ⅓ cup of water. In a big baking dish place 4 lasagna sheets, add 1/4 of the ricotta and egg mixture and continue on top with a new layer of 4 lasagna sheets, overlapping them a little. Spread half of the pesto over the sheets, then the same amount of the ricotta and egg mixture. 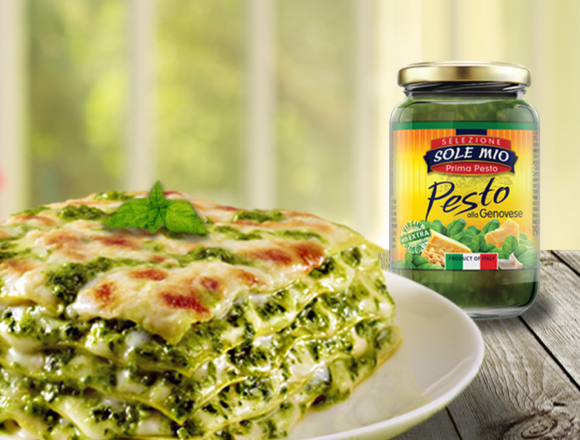 Arrange the rest of the lasagna sheets on top, and cover them with the remaining pesto and mixture. Sprinkle on top with Parmesan cheese and mozzarella. Cover the baking dish with a nonstick aluminum foil and bake it in the preheated oven for 35 minutes. Remove the foil, turn the oven to grill and let the lasagna for 5-10 minutes, until the top is brown and bubbly. Remove the lasagna from the oven and let it rest for at least 5 minutes. Before serving, sprinkle on top with a few fresh basil leaves.